Size of Male: 110-130 lbs., 25-27 in. Size of Female: 100-120 lbs., 24-26 in. A certified and proven watch dog, the Bullmastiff is amazingly quiet. You’ll find this gigantic breed sociable and yet territorial, playful and yet self-assured. It is immensely strong and has an impressive muscular tone to show. For the kind-hearted pet owner, this breed might be a handful to manage, but for the seasoned dog lover, the Bullmastiff is a fine catch. As you can guess from their name, Bullmastiffs descended from the bull dogs and the mastiffs of Old England. Talk about the breed dates back to as early as the 1760s. It was only in the 1860s, however, that this large dog breed rose to prominence. The breed’s silent nature and its ability to execute sneak attacks made it a valuable asset in English estates. These dogs were instrumental to the capture of many poachers who trespassed game preserves in the late 19th century. Today, this large and powerful dog continues to live up to its reputation as a great watch dog. These large dogs tend to exhibit very contrasting temperaments, depending on where you find them. Within the home, they make loving companions who will socialize with you with gusto. Remind the kids not to toy with a their pups though. The breed is instinctively protective of its own brood and might misinterpret some gestures as a threat to the pups. Outside the home, they can be sneaky, intimidating and strong. They will exhibit aggressive behavior towards strangers and other canines, and will bite if threatened. They are notorious for being stubborn as well and can really test your patience. Early socialization is recommended to temper their domineering attitude and to teach them how to tell friends from foes. Living Environment – The bulky size of this breed makes space a core requirement. You need to house the pooch in an adequately sized residence where it can move about without breaking or knocking down things. A fenced yard is a huge plus. Since they don?t make a lot of noise, these dogs may also be suited for apartment living. Either way, make certain that the environment is cool and secured. They also have a very low tolerance to humidity. Grooming – This large dog breed has minimal coat care needs. Although it is a medium shedder, it has a short and coarse coat that’s not that hard to brush. Alternatively, you can use a special pair of gloves or a deshedding tool to massage the dog and remove dead hairs during shedding season. You may also want to constantly wipe the Bullmair mouth area. Saliva dribbling is one of the breed’s not-so-endearing behaviors. 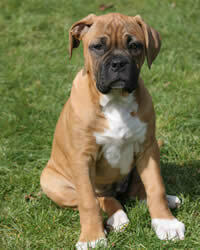 Diet & Exercise – The Bullmastiff breed requires no more than 1 or 2 feedings in a day. The portions are often measured in cups to establish some feeding consistency. If you are caring for a puppy, you can feed a 3-month-old pup thrice a day. This dog breed is not picky with food, but complete kibble mixed with raw bones, fresh vegetables and real meat seems to be the norm. The genuine food items help address flatulence issues. Exercise is needed to prevent any weight issues, but be careful not to expose your pet under the frying heat of the sun. You may let your dog jog with you on early mornings or take the dog out for a long, leisurely walk in the evenings. Health – On the average, this large dog breed lives up to only a decade. Though they look very powerful and strong, many of them succumb to coronary heart disorders, bone diseases, joint pains, elbow dysplasia and cancers. They are extremely sensitive to humid temperatures and can easily die from heat stroke. Training the Bullmastiff is no job for the novice and the gentle dog owner. The breed is intelligent but it is also infamous for its stubborn streak, so you must establish yourself as the alpha leader. It is only when you are firm and consistent with your ways that the breed will yield to your instructions. Execute respect training first before teaching them anything else.